Emile Heskey struck with an injury-time volley to earn a point for Wigan and leave Chelsea's hopes of winning the Premier League hanging by a thread. Wigan keeper Chris Kirkland made fine saves from Nicolas Anelka and Salomon Kalou while John Terry hit the bar. 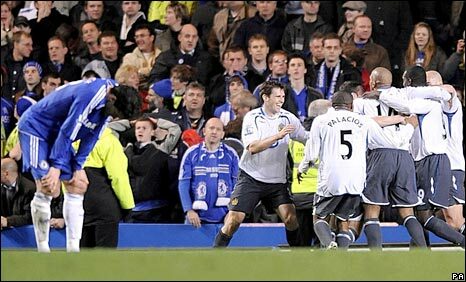 Chelsea eventually took the lead when Michael Essien struck from 20 yards. But Heskey converted Jason Koumas's teasing cross to leave Chelsea five points behind leaders United with four games left to play. Heskey's goal is a hammer blow for Chelsea and a severe punishment for their failure to kill off the game after taking the lead with 54 minutes played. The warning signs had been there when when Latics substitute Antoine Sibierski forced a decent save from Petr Cech minutes before Heskey scored. And once the final whistle sounded a chorus of boos rang out across Stamford Bridge as manager Avram Grant made his way down the tunnel. But the draw is a superb result for visiting team Wigan, who are now six points clear of the relegation zone. The Latics refused to give in and boss Steve Bruce was visibly delighted at the end, but in truth it was a far from inspired Chelsea performance. Chelsea boss Grant, doubtless with Thursday's match against Everton in mind, opted to rest Didier Drogba, Joe Cole and Ricardo Carvalho, while Frank Lampard withdrew for personal reasons shortly before kick-off. The changes presented Anelka with a rare opportunity to lead the line and he should have scored after five minutes but headed wide from six yards. The France international appeared to have put his team in front later in the half with a looping header but was denied by Kirkland's brilliantly athletic save. Paul Scharner then headed towards his own goal under pressure and it required Josip Skoko's goal-line clearance to ensure the Latics remained on level terms. But these were all-too-rare chances in a rather humdrum opening half, played out in front of a crowd that seemed underwhelmed by events on the pitch. And Wigan, who appeared comfortable for the most of the opening 45 minutes, were not without opportunities of their own. Scharner had a shot blocked while Cech, playing with a special chin strap to protect the 50 stitches he had in a facial wound last week, made a smart save at his near post to deny Antonio Valencia. Cole replaced the ineffectual Florent Malouda at the break and his arrival coincided with a much a greater sense of urgency from the home team. Terry crashed a volley against the crossbar from a corner and Kirkland brilliantly smothered a Kalou shot before Essien finally found the net after 55 minutes. Anelka slipped but regained his footing to lay the ball off to Essien, whose 20-yard strike took a slight deflection off Emmerson Boyce on its way to goal. All three chances fell within the space of 60 seconds - and from the moment Essien struck the home team seemed firmly in control. Kirkland saved a header from Alex, Michael Ballack drilled a free-kick over the bar and Joe Cole narrowly missed as Chelsea looked for a decisive second goal. But the late chances fell to Wigan, with substitute Sibierski's miss followed by Heskey's equaliser.